After sharing the product review, I thought it would be nice for my readers to try out the products too.I am teaming up with bareMinerals to do a giveaway! 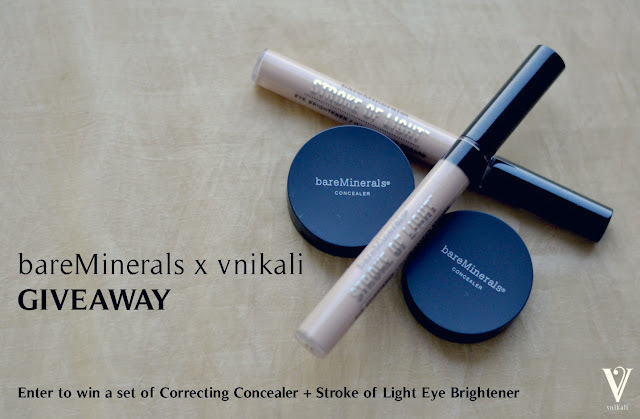 We will be giving away 2 sets of Correcting Concealer (Light 2) and Eye Brightener Concealer (Luminous 2) this week. 2 lucky winners will get the chance to try out these product for FREE! -Leave your name and email address (on this post, NOT on vnikali Facebook) so I can contact you if you win. You have until Tuesday the 13the of November. Winners will be drawn random generator.